Even when you are dressing for comfort, you always want to ensure that your fashion game is on point, which is exactly what this casual women’s tee does. 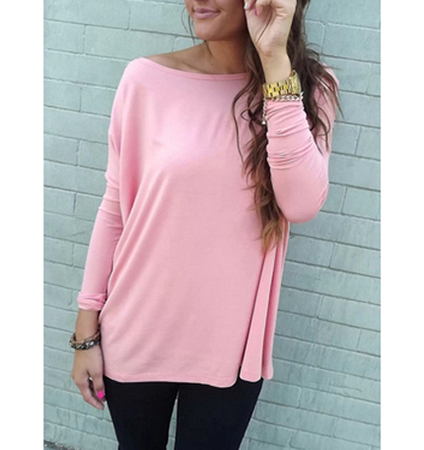 It features a loose, comfortable fit, long sleeves, and an oversized, rounded neckline. Crafted from 100% cotton, it can be safely machine washed and should be laid flat to dry. Its laidback, casual design makes it ideal for layering with other clothes for fall. This shirt is available in your color choice of light pink or baby blue. It is available for purchase in sizes small through extra large.